Simple, intelligent, bright and cheerful, this early childhood concept book introduces animals and numbers and celebrates indigenous art in a joyous, non-didactic and playful way. Ten Scared Fish is an animal counting book with a difference. Following the river to the sea, the reader meets and counts the animals until finally ten little fish meet a big scary shark! Bold illustrations and a delightfully playful text help readers familiarise themselves with prepositions as well as animals and numbers. Ros Moriarty, formerly a journalist with Radio Australia in Indigenous affairs, women's issues and the environment, has spent most of her professional life as managing director of Australia's leading Indigenous design studio, Balarinji, a business she established with husband John Moriarty in 1983. Balarinji is best known for covering Qantas 747 aircraft in Indigenous art. During 27 years of delivering groundbreaking projects, including the Emu Dreaming tutu for the Australian Ballet's 40th birthday and the Hands across the Land poster for the 2000 Sydney Harbour Bridge Walk for Reconciliation, the company has fostered the careers of a large number of Indigenous artists and designers from all over Australia, and returned royalties to NT artists since 1995. Ros Moriarty is the author of an acclaimed memoir, Listening to Country, and founder of a non-profit organisation, Indi Kindi, supporting pre-literacy education. Ten Scared Fish is a very colourful and delightful book about following the waterhole to the saltwater by counting different creatures till they reach a shark in the ocean.Written by Ros Moriarty, who wrote Listening to Country, which was her much-acclaimed first book and illustrated by Balarinji who is best known for covering Qantas 747 aircraft in Indigenous art. The story is clever and keeps the children interested as they can count using vivid Aboriginal art and uses not the standard counting concept. The idea of a counting to 10 books is not a new one; yet, the way Ros Moriarty has written this book makes it interesting and relevant to Australian children.This book would be appropriate and fascinate the pre kinder to prep age group as the pictures were interesting with bold colours and a good resource to introduce children to Aboriginal art.It would be a wonderful inclusion in any Australian Society and History unit as teachers could use it with children to develop the idea of painting and native language as the language of the Yanyuwa people is included. This is a beautiful and bright introduction to both Aboriginal art and counting. Ten Scared Fish is a simple counting book involving the enchantments of the sea – turtles, snakes and fish etc – to get children interested in numbers.The bright colours and distinctive designs will capture very young children, and the repetition of the phrase structures will enforce the counting message. Children will have lots of fun counting the animals and seeing the big shark at the climax of this story.Ten Scared Fish is aimed at very young children as it does not have a very strong storyline and is mainly focused on simplicity of pictures, fun with animals and counting up to ten. I don’t think it would have very much appeal for more advanced readers, who would prefer (even slightly) longer and more complex books with stronger storylines. But for very young children, it could be a good story both at home and school, to go over with learning numbers and seeing some fun sea creatures. I was also interested to note expressions like “waterhole” and “river grass” come up, unusual for picture books, which helps children learn more about these animals and words that are connected with their habitat. Ten Scared Fish is a wonderful addition to my children’s bookshelf. The aboriginal artwork ties in beautifully with what my son learnt in prep last year and what my daughter will learn this year. The use of repetition and image prompts encouraged my children to read independently and the intrigue ensured they kept turning the pages to see what would happen next. Including numbers not only helps children with their counting, but also encourages those who can count to attempt the words that follow. My children loved reading Ten Scared Fish because the numbers, imagery and repetition allowed them to read almost the entire book by themselves. Robert (male – grade 1) said, “I really like the snakes and shark”. Charlie (female – prep) said, “I loved guessing what was coming on the next page”. Kasey (female – 3 years old) enjoyed using the numbers and pictures to guess what she thought the words might be instead of pretending to read, which is what she usually does. Ten Scared Fish is a great book for introducing kindergarten children to reading and establishing basic counting skills. It’s also a great book for boosting confidence and encouraging children in prep, who haven’t quite mastered the basics of reading yet. Carol Tillyer (Robert and Charlie Tillyer attend Donburn Primary School), Victoria. 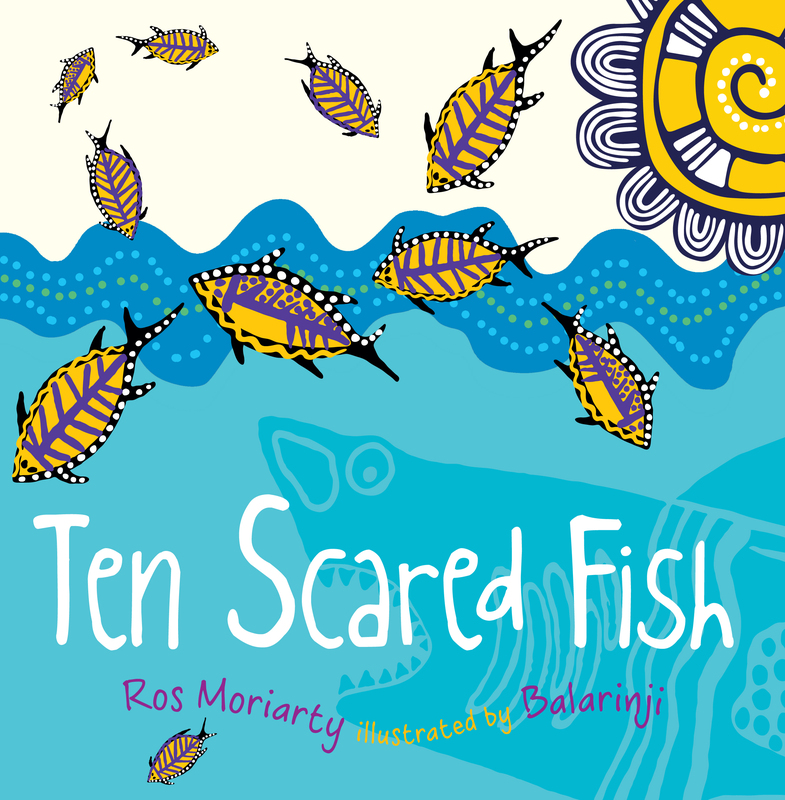 Ten Scared Fish is a very colourful, bright and illustrated using animals, numbers and art from the Balarinji design studio.. The aboriginal drawings are simply, traditional and very eye catching. The children were able to recognise these drawings were aboriginal and not the pictures they were used to seeing at story time. 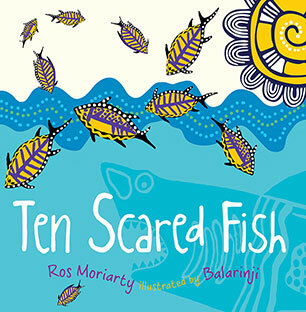 Ten scared fish is a very simply 1-10 counting book. The book starts off with 1 turtle by the waterhole until the turtles meet a snake. 4 snakes are now in the river grass until they meet a fish. Now 7 fish are in the salt water until there are 9 and they meet a shark. The children really enjoyed the animals changing every few pages. Especially at the end when the fish were meet by a shark. The children would yell out shark, at the end of the story. On the last page of “Ten scared fish”, the story was written in Yanyuwa language .Yanyuwa is spoken by aboriginal families in Borroloola Northern Territory. I really enjoyed sharing this story and my attempts of the Yanyuwa language with my class. I always enjoy sharing different cultures with my class, as it opens up[ a whole range of discussions among the children. This book was very easy to read ad I would recommend Ten scared fish to children aged 3 and up. Lots of activities were planned from this book. As a class we discussed all the different languages we knew and we learnt some new ones. We made our own aboriginal paintings and our own fish to display. We also made didgeridoos and painted our faces in aboriginal colours. We have also planned to do our own cave paintings as well. A great way of introducing indigenous cultures to a young class. Ros Moriarty is the founder of Indi Kindi pre literacy education and that is where this book is aimed. The text is deceptively simple and relies a lot on repetition and natural features such as turtles, waterholes, snakes, and fish familiar to indigenous people. Humour shows itself in the page of one big shark mouth and ten scared fish. The illustrations are colourful and a good representation of Aboriginal art in its simplest form. The back page also contains the text in Yanyuwa which is the language spoken by Aboriginal families in the Northern Territory. For a lot of reasons this will be a useful tool for indigenous pre-literacy as the text is basic and does not vary a great deal as it counts up through the pages. From my point of view this would surely limit the usefulness and appeal of this book to many , as it is not the sort of book that is going to hold up to constant re-readings. But for what it is intended for, as an early pre- literacy reader of indigenous communities, it is worth a good look. I am happy to concede I know nothing about indigenous literacy and reading whereas with her involvement with the ingenious community, I am sure Ros Moriarty knows and understands a lot more about that and what is needed. The artwork is bright and cheerful and should appeal. This book could be used as an introduction to Aboriginal art and culture and the varying indigenous languages.